What an awesome week we’ve had here in the New Port Richey area! Beautiful weather, great fishing and really good company on the boat. One of my clients, Eric, was supposed to have a female companion on this trip but plans didn’t work out for her to come so he and I ventured out on our own. Man did she miss out! We didn’t wear the fish out as far as numbers go but Eric did get into some really nice redfish and trout. Including a monster! The fish measured just over 39″ long and weighed just over 22lbs. It was a real “pig”. Eric also got into some 25-30″ reds and some trout in the 18-23″ range. It was a great day and though we didn’t catch 100 fish, he was treated to some real bruisers. Today I fished with Dan and his son Mikey. The day started late as the the bait catching took way longer than expected. Again, today wasn’t a big “numbers” day but we did get into some really nice sized fish. Dan and Mikey have a good bit of fishing experience and they didn’t want to go “catching”. They wanted to go fishing for really nice sized fish. 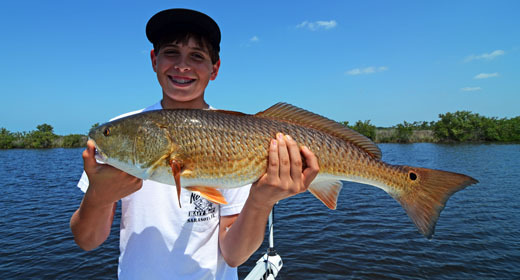 So we spent some time being patient at a big redifsh spot and we got 4 bites and Mikey got one really nice 30″ red to the boat. Then we headed off to get some dinner and the first few spots didn’t pay off as well as they had in the recent past but the 4th spot helped us get close to our limit of trout. They were avid Yankee fans and with me being a former Yankee, we had a great time talking baseball and pinstripes. The fishing and conversation really made for a great day. The weather has been great as of late and we’ve had big number days and big fish days. They haven’t always come together but the fishing has been really good for the most part. We’ve seen some really nice cobia on the flats (though we haven’t hooked into any yet this year), trout are still going good, redfish are BIG, snook are BIG, and tarpon are just showing up. Speaking of tarpon… tarpon season is just 2 weeks away and if you have it in your mind to hook into a 100+lb fish, you need to book your date now as I already have 20 trips booked for June tarpon fishing in St. Petersburg. I have slightly less on the books for May but those dates will fill up fast as well. Tarpon season is always busy for me so don’t hesitate to get in on the action now. Call me for rates and availability.